Folding shower doors have become more popular, as many homeowners are looking for ways to increase the value of their homes through updates. Updating your bathroom can be as easy as changing the depth of glass in your shower doors, or even changing from framed to frameless. Remember that when your home is appraised with folding shower doors, the frameless versions can add up to $2,500 in equity overall to the home. Folding shower doors have many options including framed and frameless, differing depths of glass as well as designs in the glass or even upgraded materials. Framed doors sit on a track much like sliding doors. The difference between the sliding and the folding types is that there is a hinge in the center of each piece of safety glass. The safety glass in folding doors comes in depths of 1/8, 1/4 and 3/8 inch variations. This makes a difference as to the type of frame that can be used, and the largest difference is in the prices. Retailers charge more for thicker glass, as well as differences in length of the hinged areas. The average width of one panel of safety glass used in hinged shower doors that only have two panels is 24 inches, while larger areas may require more doors panels be used to cover the area. For tubs or stalls that are wider than 48 inches, it is recommended that a professional be sought to complete the work as custom doors will be required. Glass used for these bifold doors ranges in designs from obscure glass, frosted glass to clear glass or even custom design etching. Smoked glass and unfinished glass are commonly found in more modern frames, while frameless models generally use clear glass. Framed doors have options for materials, as many less expensive models are made of anodized aluminum. Brushed nickel, brass, wood appearance or even plastic can be found as well as gold tone surfaces. 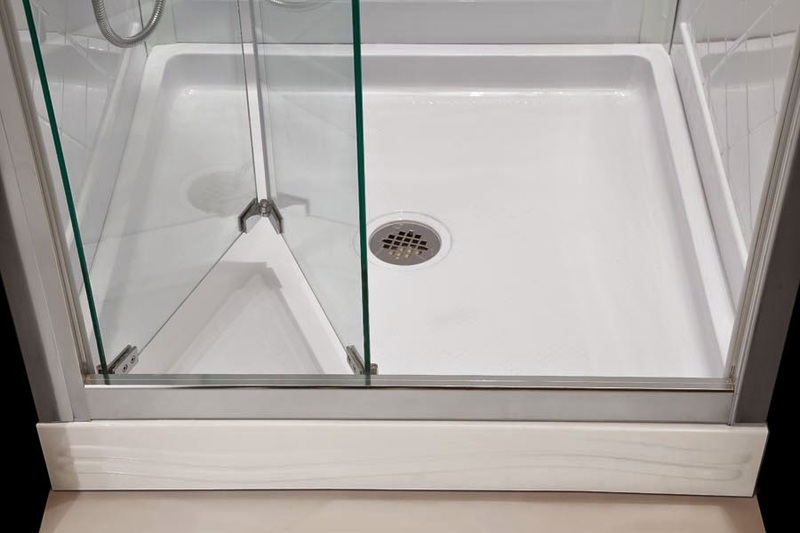 For frameless doors in your tub or stall, there is no enclosure but the hardware used for support at the top and bottom of the doors can also be purchased in these same finishes and materials. However, the tracks used for the top and bottom of the frameless doors will be sealed, and therefore the interior of the shower tracks should be protected. The enclosure options vary, as many people opt to use the magnetic enclosures for folding doors. These enclosures consist of a magnet on the inside track and metal on the inside of the door matching up correctly to provide a secure match. Even when wet, these magnets work as well as they do in any other environment.